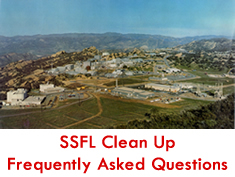 Learn about the potential for offsite exposures from the Santa Susana Field Laboratory at the next SSFL Work Group Meeting: Wednesday, June 18th 6:30 PM, Simi Valley Cultural Arts Center, 3050 E. Los Angeles Avenue, Simi Valley, CA 93065. The SSFL Work Group is Back! The Rocketdyne Cleanup Coalition is thrilled to announce the return of the Santa Susana Field Laboratory Inter-Agency Work Group! RCC has been a member of the SSFL Work Group panel for over 20 years. The next meeting of the Santa Susana Work Group is Tuesday, May 3, at 6:30 p.m.